One of the most widely grown small shrubs must be Golden Diosma, its grown as a filler in the garden, as a low hedge and in many commercial and council plantings. A plant that is so widely grown must have a few good points and this one certainly does. 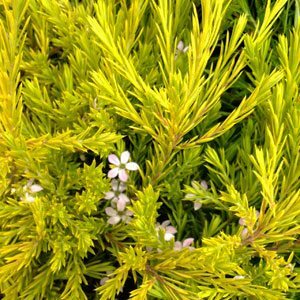 The botanical name is Coleonema pulchrum ‘Aurea’ and it is simply known as Golden Diosma, and is readily available form retail nurseries also as dwarf golden diosma. The strong points are the hardy drought tolerant nature, good foliage year round, attractive flowers and very easy to prune. This is one of the most versatile low hedging plants available. For a good dense hedge, try spacing plants at around 80cm apart, the lower growing varieties at around 60cm. Easy to grow and prune and generally a tough plant. Great yellow foliage, grows to about 1.7m and has masses of small pink flowers in spring. Used widely as low hedge, a ground cover plant where it is planted en masse, but also useful as a filler in the border, or as a stand alone feature plant. Golden Diosma prefers full sun, it is frost tolerant, drought resistant once established and generally problem free. Best grown in full sun to a little light shade. A well drained soil i required. Mulch around the plant to suppress weeds and maintain some moisture. The main trick with pruning Golden diosma is not to prune it in summer.